No one expected the LSU Tigers to reach 10 wins this season, but that’s exactly what they did, going 10-3 and beating UCF in the Fiesta Bowl. 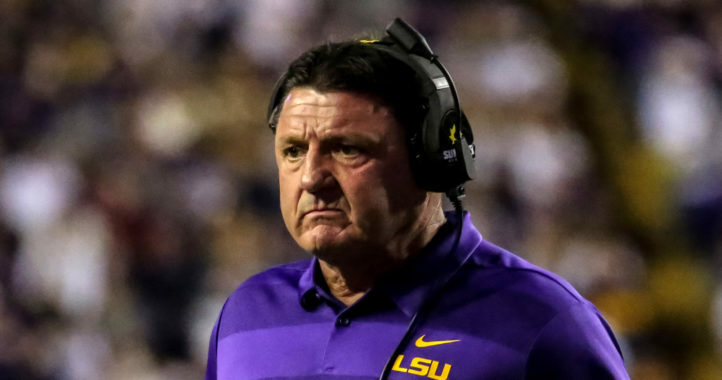 With some top talent returning to the field this fall, much will be expected from coach Ed Orgeron and the Tigers, and the LSU administration clearly believes in him. This extension will take effect after his current deal expires following the 2021 season. He currently makes $3.5 million per season. Will the Tigers continue to roll under Coach O? 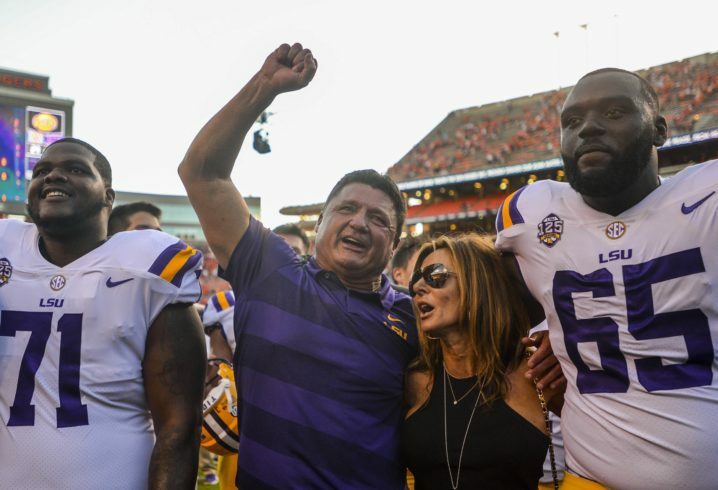 We’ll find out starting this fall, but for now, there’s no reason to doubt what Orgeron is doing in Baton Rouge. “No one expected the LSU Tigers to reach 10 wins”. That’s a hell of a statement. I expected LSU to reach 10 wins. I’m sure a lot of LSU fans expected it, because no one knows a team better than its fans. We knew. I was surely hopeful, and predicted it on this site. LSU fans have high expectations. Most are realistic, but the expectations are still high. We should be even better this upcoming season. Funny thing, if not for my lack of faith in Orgeron and Ensminger, I would have LSU as a top 5 team with all their talent/experience returning… and Aranda. He’s won two of three from the Aggies and only lost the one on disputed calls. 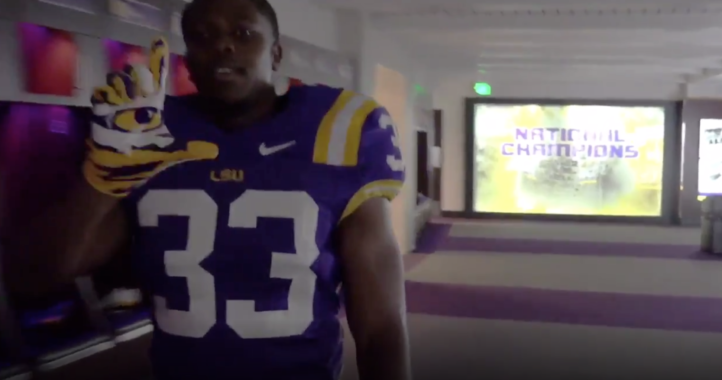 Y’all won’t get those calls in Tiger Stadium. Enjoy your one game winning streak. LSU and Orgeron finished in the top 10, so the Aggie loss really meant nothing. Even with a win, LSU would have finished no higher than sixth. Maybe one day your Aggies will find themselves in the top 10. I don’t see that next season though. You are going to have to have patience. Just my opinion, I don’t think Orgeron/Ensminger are the right coaches to get you to the CFP. I remember Slocum firing Ensminger as our OC after a 6-6 season way back when. I have a feeling the LSU game will prove to be the hardest game on the schedule for the Aggies, and that’s saying something this season. And BTW, you can discount the Aggie win over LSU all you want, but finding a way to win that game meant quite a bit to every player involved and they will remember what is possible in a close game with time running out. But yeah, just keep repeating… “disputed calls” and it “really meant nothing”. It’s all true. The calls were clearly disputed and the loss meant nothing to LSU in the final rankings. The game clearly meant something to the Aggies, but they aren’t my concern. I’ll keep having this conversation if you want. The knee was down, the fumble/incomplete is called incomplete all the time. The only call that was slightly disputed by other refs was the PI call against LSU in the end zone. If you re-watch the game, the same ref called almost the exact same type call against the Aggies earlier in the game, so he was at least being consistent. So yeah, keep on… “clearly disputed”. You want to keep hanging on to that for a game that meant nothing. I’m way over it. LSU finished 6th in the country. We couldn’t have asked for anything more this season. With a win over Texas A&M, LSU would have finished 6th. As I said earlier, no impact. LSUSMC, how’s that search going? Certainly with your credibility, lol, that’s a joke, on the line, I’m sure you want to clear matter up. Folks, this guy makes up statements about others. Some would call hill a lair, but he gives liars a bad name. So LSUABC,clear that matter up. Some say you’re a Bama fan.True? LSU, 6th in the country, 3rd in the SEC West behind A&M. Meh, no impact. Sure, you’re “way over it”. I’d always rather finish sixth in the country that anything other than first in the SEC West. I understand this was the Aggies best finish ever in the SEC, but LSU has finished second in the West multiple times. No glory there. I thought the team that finished first in the SEC East a couple of years ago that played Alabama in the national championship game finished higher than sixth. But I guess LSUABC would have rather finished 6th in the country that year that admit Georgia had a decent team. BUT he’ll lie his way out of this one too. What a moron. LSU plays in the West. Try and keep up. There is no way for us to win the East. Louisville sucking really seems to bother you. Same with Kentucky having a good season. This just isn’t your year. aggierider, the reason this is the best finish in the SEC for A&M is they haven’t been in the SEC that long. You know that and I know that but LSUABC doesn’t. He really has difficulty telling the truth and when he can’t match your wisdom, he will soon be calling you a Texas fan, swore you said you were and than attempt to slander you. It’s his ‘escape’ mode. Ask him hope long his true favorite team it has been until this year, that the Cats won more SEC games than they loss. Chances are he won’t answer you but start slandering you with comments about your age, medical condition, etc. The guy doesn’t like to take facts, stats, you know things that would prove his point. I don’t care about your age or medical conditions. I just know you are a moronic Louisville fan than continuously trolls Kentucky and now me because I called you out. Don’t act like this really upsets you as you love the attention. Sick puppy. Kentucky Football: My Favorite Moments Of The 2018 Season. It will clarify my claim of LSUABC being a liar. On the column, LSUABC stated I was a Louisville fan, and a Kentucky troll. Stating MY team was terrible and I was trying to rain on Kentucky’s parade. LSUABC goes on to call me quite a liar and I have said I was mainly a Louisville fan. Saying I am a bitter old dude, and he has all his facilities and remembers what I said. So I challenged him to show any post ANYWHERE, ANYTIME where I said I was a Louisville fan. So anyway, LSUABC has yet to find those comments but continues to say I said it. I told him if he apologies and admits he’s lied about claiming I was a Louisville fan. O would leave him alone. He has failed to do so. I told him I will continue to follow him around and let the other posters know what they are dealing with. If you want to see what you’re dealing with, read the column. Prior to a few days ago I never went after anyone on SDS. Now, I’m laying it on as thick as I can. Maybe you should start using the term ‘witch hunt’ It fits you better. Kentucky had a good year. Heck, it was the best year in FORTY YEARS! While you still continue to lie about me being a Louisville fan, and going to produce ANY POST you find were I said that, your credibility is worthless. Admit your a liar, apologize, and I’ll won’t keep reminding what you are. If you don’t realize we are going to kick your girls arse in Starkvegas on Wednesday, you are one dumbsh!t cajun sarge.